Areas of control as of November 20, 2016 in the Iraqi, Syrian, and Lebanese conflicts. 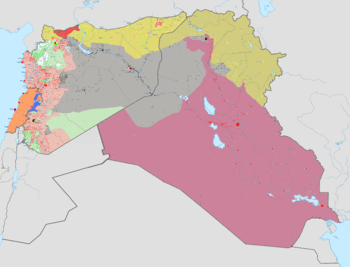 When the group changed its name to Islamic State of Iraq and the Levant and expanded into Syria in April 2014, it claimed nine Syrian provinces, covering most of the country and lying largely along existing provincial boundaries: Al Barakah, Al Khayr, Raqqah, Homs, Halab, Idlib, Hamah, Damascus, and Latakia. It later subdivided the territory under its control to create the new provinces of al-Furat, Fallujah, Dijla, and al-Jazeera. ISIL suffered reversals from mid-2015 when they were expelled from much of Derna following clashes with rival militants, following months of intermittent fighting, ISIL eventually redeployed to other parts of Libya in April 2016. Libya’s Interim Government launched a major offensive against ISIL territory around Sirte in May 2016, driving them back towards the city from the east and the west, and capturing parts of the city the following month. In February 2014, the Mujahideen Shura Council in the Environs of Jerusalem declared its support for ISIL. On 2 April 2015, elements of this group, along with members of the Army of Islam and the Gaza faction of Ansar Bait al-Maqdis, formed the Sheikh Omar Hadid Brigade, also known as Islamic State in Gaza, as it predominantly operates in the Gaza Strip. The group is opposed to the existence of both the State of Palestine and Israel, and has attacked both Israel and Hamas in the past. 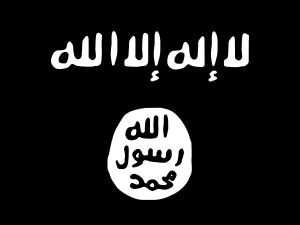 ISIL established a Yemeni Wilayah in November 2014. The branch's first attack occurred in March 2015, when it carried out suicide bombings on 2 Shia Mosques in the Yemeni capital. At least 7 ISIL Wilayat, named after existing provincial boundaries in Yemen, have claimed responsibility for attacks, including Hadhramaut Province, Shabwah Province and Sana'a Province. Following the outbreak of the Yemeni Civil War in 2015, ISIL struggled to establish much of a presence in the country in the face of competition from the larger and more established Al-Qaeda in the Arabian Peninsula (AQAP) militant group. Many of ISIL's regional cells in Yemen have not been visibly active since their establishment and the group has not been able to seize control of territory the way they have done in Iraq and Syria. The group has also experienced leadership turmoil and defections from its rank and file. Members of Jund al-Khilafah swore allegiance to ISIL in September 2014. ISIL in Algeria gained notoriety when it beheaded French tourist Herve Gourdel in September 2014. Algerian security forces killed the group's leader, Khalid Abu-Sulayman, in December 2014, and five of its six commanders in a May 2015 raid. Since then, the group has not claimed any significant attacks and has largely been silent. On 29 January 2015, Hafiz Saeed Khan, Abdul Rauf and other militants in the region swore an oath of allegiance to Abu Bakr al-Baghdadi. Khan was subsequently named as the Wāli (Governor) of a new branch in Afghanistan and Pakistan called Khorasan Province, named after the historical Khorasan region. ISIL attempted to establish themselves in Southern Afghanistan, especially in Kandahar and Helmand provinces, but were resisted by Taliban forces. They were able to establish a foothold in parts of Nangarhar, and recruited disaffected members of the Taliban. In August 2015, the Islamic Movement of Uzbekistan leader, Usman Ghazi, swore allegiance to ISIL and announced that the group should be considered part of Wilayah Khorasan. The group suffered reversals in 2016, losing control of some territory in the wake of attacks from US Forces, the Afghan Government and the Taliban. On 7 March 2015, Boko Haram's leader Abubakar Shekau pledged allegiance to ISIL via an audio message posted on the organisation's Twitter account. Abu Mohammad al-Adnani welcomed the pledge of allegiance, and described it as an expansion of the group's caliphate to West Africa. ISIL publications from late March 2015 began referring to members of Boko Haram as part of Wilayat Gharb Afriqiya (West Africa Province). Boko Haram suffered significant reversals in the year following the pledge of allegiance, with an offensive by the Nigerian military, assisted by neighboring powers, driving them from much of the territory they had seized in North East Nigeria. Boko Haram suffered a split in 2016, with ISIL appointing 'Abu Musab al-Barnawi' as the group's new leader, due to disagreements with Abubakar Shekau's leadership. This was rejected by Shekau and his supporters, who continued to operate independently. ISIL militants in Syria issued a threat to Russian President Vladimir Putin in 2014: "we will liberate Chechnya and the entire Caucasus, God willing. Your throne has already teetered, it is under threat and will fall when we come to you because Allah is truly on our side." In early 2015, commanders of the militant Caucasus Emirate group in Chechnya and Dagestan announced their defection and pledge of allegiance to Abu Bakr al-Baghdadi. In a June 2015 audio statement posted online, ISIL spokesman Abu Mohammad al-Adnani accepted the pledges of allegiance and appointed Abu Muhammad al-Qadari (Rustam Asildarov) as ISIL Governor of a new Caucasus Province. He called on other militants in the region to join with and follow al-Qadari. The group has carried out occasional, low-level attacks since then. On 10 July 2015, ISIL released a video containing a message saying that they intend to conquer the western Balkans, including Serbia, Croatia, Bosnia and Herzegovina, Albania, Kosovo, the Republic of Macedonia and Montenegro. ISIL Spokesman Abu Muhammad al-Adnani stated that "the legality of all emirates, groups, states and organizations becomes null by the expansion of the khilafah's [caliphate's] authority and arrival of its troops to their areas." ISIL thus rejects the political divisions established by Western powers during World War I in the Sykes–Picot Agreement as it absorbs territory in Syria and Iraq. The Long War Journal writes that the logical implication is that the group will consider preexisting militant groups like Al-Qaeda in the Arabian Peninsula (AQAP) and Al-Qaeda in the Islamic Maghreb (AQIM) illegitimate if they do not nullify themselves and submit to ISIL's authority. ↑ "ISIS introduces 'Golden Dinar' currency, Hopes it will collapse U.S. dollar • The Foreign Desk". 6 July 2016. ↑ "ISIS Governance in Syria." (PDF). 1 2 "The Islamic State's model". The Washington Post. 28 January 2015. Retrieved 13 March 2015. 1 2 3 4 "Islamic State builds on al-Qaeda lands". BBC News. 30 January 2015. Retrieved 13 March 2015. 1 2 3 "ISIS Global Intelligence Summary March 1 - May 7, 2015" (PDF). Institute for the Study of War. 10 May 2015. Retrieved 12 May 2015. 1 2 "ISIS Declares Governorate in Russia's North Caucasus Region". Institute for the Study of War. 23 June 2015. ↑ "The Rump Islamic Emirate of Iraq". The Long War Journal. 16 October 2006. Retrieved 2 June 2014. ↑ "ISIS' 'Southern Division' praises foreign suicide bombers". The Long War Journal. 9 April 2014. Retrieved 2 June 2014. ↑ "Middle East – تنظيم الدولة الإسلامية يعلن قيام "ولاية الفرات" على أراض سورية وعراقية – فرانس 24". France 24. 31 August 2014. Retrieved 6 September 2014. ↑ Aymenn Jawad Al-Tamimi (10 September 2014). "Islamic State "Euphrates Province" Statement: Translation and Analysis". aymennjawad.org. Retrieved 20 September 2014. ↑ "The Islamic State" (PDF). The Soufan Group. 28 October 2014. Retrieved 16 March 2015. ↑ "Islamic State Announces Creation of Second New Province in Northern Iraq". SITE Intelligence Group. 19 February 2015. Retrieved 16 March 2015. ↑ "Islamic State Sprouting Limbs Beyond Its Base". The New York Times. 14 February 2015. Retrieved 23 February 2015. ↑ "ISIS atrocity in Libya demonstrates its growing reach in North Africa". CNN. 17 February 2015. Retrieved 23 February 2015. ↑ "The Islamic State of Libya Isn't Much of a State". Foreign Policy. 17 February 2015. Retrieved 10 June 2015. ↑ "The Islamic State's Burgeoning Capital in Sirte, Libya". Washington Institute of Near East Policy. 6 August 2015. Retrieved 6 September 2015. ↑ "ISIS shifts to Libya". The Washington Free Baecon. 12 January 2016. Retrieved 16 January 2016. ↑ "Libya officials: Jihadis driving IS from eastern stronghold". Associated Press. 30 July 2015. Retrieved 1 August 2015. ↑ "Islamic State in retreat around east Libyan city: military". Reuters. 20 April 2016. Retrieved 20 April 2016. ↑ "Libyan security forces pushing Islamic State back from vicinity of oil terminals". www.reuters.com. 31 May 2016. Retrieved 31 May 2016. ↑ "Libyan brigades capture air base from Islamic State south of Sirte: spokesman". 4 June 2016. Retrieved 24 June 2016 – via Reuters. ↑ "Libyan forces make gains against ISIL in Sirte". Retrieved 24 June 2016. ↑ al-Ghoul, Asmaa (27 February 2014). "Gaza Salafists pledge allegiance to ISIS". Al-Monitor. Gaza City, Gaza Strip. Retrieved 25 September 2014. ↑ Levy, Rachael (1 July 2014). "Egyptian group claims it killed the Three Israeli Teens". Vocative. Retrieved 2 June 2015. ↑ "Egypt attack: Profile of Sinai Province militant group". BBC News. BBC Monitoring. 30 January 2015. Retrieved 2 June 2015. ↑ Levy, Rachael (9 June 2014). "ISIS: We Are Operating in Gaza". Vocative. Retrieved 2 June 2015. ↑ West, Allen (24 June 2014). "ISIS plans to destroy 'Zionist regime' in Israel – with nukes if necessary". AllenBWest.com. Retrieved 2 June 2015. ↑ "ISIS caught on video burning the Palestinian Flag". CounterCurrentNews.com. 26 August 2014. Retrieved 2 June 2015. ↑ al-Shihri, Abdullah (7 August 2015). "Saudi Arabia mosque bombing that killed 15 claimed by 'new' Islamic State group". The Age. Retrieved 7 August 2015. ↑ "Yemen crisis: Islamic State claims Sanaa mosque attacks". BBC News. 20 March 2015. Retrieved 24 March 2015. ↑ "More Islamic State members reject governor of Yemen Province". Long War Journal. 28 December 2015. Retrieved 29 December 2015. ↑ Fadel, Leila (18 November 2014). "With Cash And Cachet, The Islamic State Expands Its Empire". NPR. ↑ "If at First You Don't Succeed, Try Deception: The Islamic State's Expansion Efforts in Algeria". Jamestown Foundation. 13 November 2015. Retrieved 7 December 2015. ↑ "Pakistani Taliban emir for Bajaur joins Islamic State". The Long War Journal. ↑ "Afghanistan drone strike 'kills IS commander Abdul Rauf'". BBC News. ↑ "ISIS reportedly moves into Afghanistan, is even fighting Taliban". 12 January 2015. Archived from the original on 13 February 2015. Retrieved 27 March 2015. ↑ Lynne O'Donnell (8 September 2015). "Islamic State group loyalists eye a presence in Afghanistan". Associated Press. Retrieved 10 September 2015. ↑ "IMU Declares It Is Now Part Of The Islamic State". Radio Free Europe/Radio Liberty. 6 August 2015. Retrieved 6 August 2015. ↑ "Taliban Captures IS Bases in Afghanistan". Voice of America. 5 January 2016. Retrieved 16 April 2016. ↑ "Nigeria's Boko Haram pledges allegiance to Islamic State". BBC news. BBC. 7 March 2015. Retrieved 7 March 2015. ↑ "Boko Haram's Buyer's Remorse". Foreign Policy Magazine. 20 June 2016. Retrieved 25 June 2016. ↑ "Boko Haram in Nigeria: Abu Musab al-Barnawi named as new leader". BBC News. 3 August 2016. Retrieved 3 August 2016. ↑ Tharoor, Ishaan (6 September 2014). "Islamic State militants want to fight Putin". The Washington Post. ↑ "Caucasus Emirate and Islamic State Split Slows Militant Activities in North Caucasus". Jamestown Foundation. 13 February 2014. Retrieved 17 February 2015. ↑ "Two North Caucasus Rebel Leaders Face Off in Islamic State–Caucasus Emirate Dispute". The Jamestown Foundation. 26 June 2015. Retrieved 5 July 2015. ↑ "IS's North Caucasus Affiliate Calls For Recruits To Join It In Daghestan". Radio Free Europe/Radio Liberty. 3 October 2015. Retrieved 3 October 2015. ↑ "ISIL terrorists want to invade Spain". Retrieved 17 April 2015. ↑ "ISIL threatened: Look forward, oh Croatia, your democracy will fall (Croatian)". Retrieved 10 July 2015. ↑ Alessandria Masi (12 March 2015). "How The ISIS Allegiance Application Process Works For Groups Joining The 'Caliphate', Like Boko Haram". International Business Times. Retrieved 16 March 2015. 1 2 Romain Caillet (December 2014). "ISIS'S GLOBAL MESSAGING STRATEGY FACT SHEET" (PDF). Institute for the Study of War. Retrieved 13 March 2015. ↑ Johnson, M. Alex (3 September 2014). "'Deviant and Pathological': What Do ISIS Extremists Really Want?". NBC News. Retrieved 5 September 2014. ↑ Tran, Mark; Weaver, Matthew (30 June 2014). "Isis announces Islamic caliphate in area straddling Iraq and Syria". The Guardian. Retrieved 6 July 2014. ↑ McGrath, Timothy (2 July 2014). "Watch this English-speaking ISIS fighter explain how a 98-year-old colonial map created today's conflict". Los Angeles Times. GlobalPost. Retrieved 22 July 2014. ↑ Romain Caillet (27 December 2013). "The Islamic State: Leaving al-Qaeda Behind". Carnegie Endowment for International Peace. ↑ JOSCELYN, THOMAS. "Analysis: Islamic State snuff videos help to attract more followers". Long War Journal. Long War Journal. Retrieved 21 November 2014.